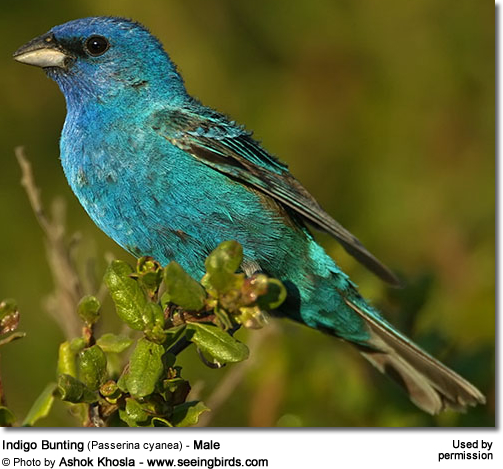 The Indigo Bunting (Passerina cyanea) - also known as Indigo Bird or Indigo Painted Finch - is a small North American finch-like bird. The breeding male can easily be identified by his indigo-blue plumage. It is a frequent visitor of bird feeders and a popular garden bird. They are known to hybridize with Lazuli Buntings in areas where their ranges overlap. 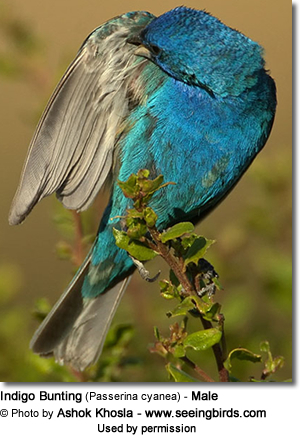 The Indigo Bunting averages 4.5 inches or 11.4 cm in length with a wingspan of 7-9 inches (18 - 23 cm). It has a small, cone-shaped bill and grey or black legs and feet. 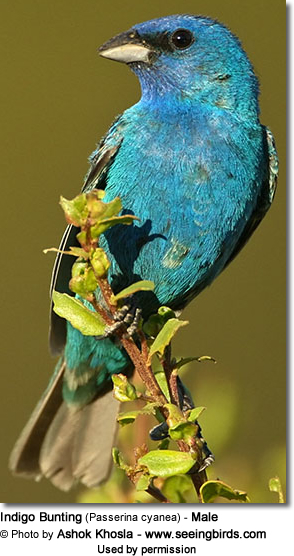 Adult breeding males have deep blue plumage; the wing and tail are black with blue edges. Outside the breeding season, their plumage is duller. 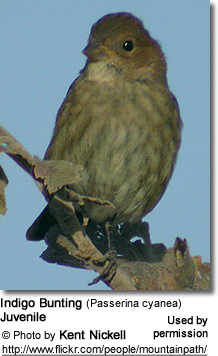 Adult females are mostly brown: darker on the upper plumage with a faintly streaked chest and a touch of blue on her tail and shoulders. ... from the Great Plains south to Texas through the eastern United States. They migrate to southern Mexico, the West Indies and Central America. They occur in western Europe as an extremely rare vagrant. 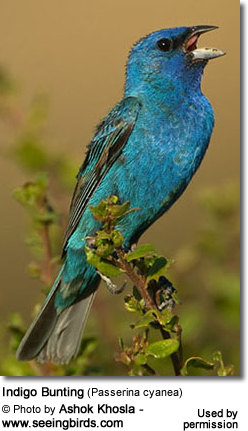 The Indigo Buntings migrate during the night, using the stars to direct themselves. During the migration, they can travel as far as 2,000 miles to or from its winter range. Captive birds will experience disorientation during the months of April and May and then again in September and October if they cannot see the stars from their enclosure. 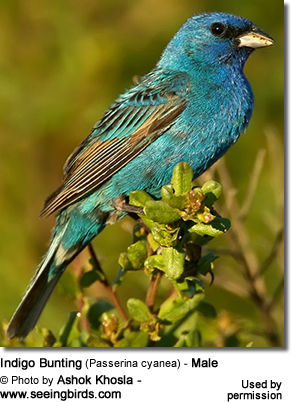 The Indigo Bunting is typically found in brushy and weedy areas along farmland, orchards, woods, powerline and railroad openings, swamps and streams. The male chooses and defends a breeding territory. The female chooses a nest site and constructs a nest using leaves, grass and bark - typically situated low in dense shrub or a low tree. These birds are monogamous but not always faithful to their partner. In the western part of their range, they often hybridize with the Lazuli Bunting. She lays 1 to 5 eggs and incubates them for about 12 - 14 days. The female alone feeds and cares for the chicks. The chicks fledge when they are 8-14 days old, but stay with the female for a few more weeks. The female may produce more than one brood a year in conditions are good. 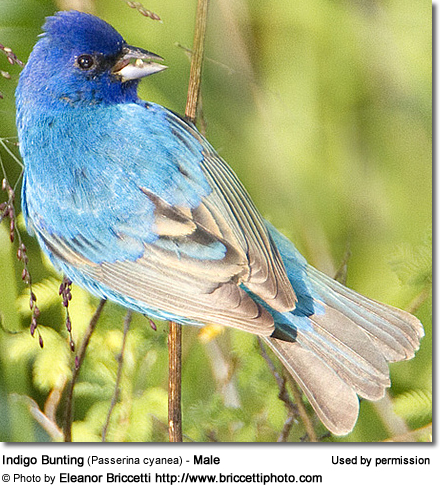 The Indigo Buntings generally forage on the ground or in trees or shrubs. Their main diet consists of insects and seeds. During the winter, they are often seen feeding in flocks. Its song is described as a high-pitched buzzed sweet-sweet chew-chew sweet-sweet.